Event organising in today’s meetings industry requires a focus on the tools and practices which can spice up events. The reason being is that attendees engage more when unusual approaches are used to enrich events. In addition, attendees are far more likely to remember events that leave an impression on their five senses – sound, smell, taste, sight and touch. With this in mind, when organising events it is necessary to lean on the ‘Power to the Meetings’ methodology. Below are some actual cases of unusual ideas that can be used to spice up events so they stand out from the norm, engage attendees, and ensure you and/or your company is ranked among the event organising stars. All that is needed are some movable walls, which cover other walls in an area, and some graffiti experts, who bring all the necessary materials, as well as a hefty dose of participant imagination. With the help of the graffiti experts, or just by following their own instinct, participants set about spraying walls and creating their own work of art which drives the imagination and fulfils the need for expression. Photo booths or photo corners, where participants can photograph themselves alone or together with new friends, encourage joy and child-like raillery. Photography can be made even more fun by using various masks and costumes. For example, at the Crossover trade show attendees were able to don various animal masks, which further spiced up the group photography experience, which they were also able to share amongst themselves. Why should the scenography of an event follow a classic pattern when it can cross the borders of the known, and radically step into a new world? It was exactly this that drove the team behind the Crossover trade show to theme the event in a jungle style, which positively surprised attendees who relaxed to the sounds, colours and feel of the jungle. Certainly an unusual idea which resulted in an unforgettable event. Whether it’s a circus or the Olympic Games, when we see someone hanging high from ropes, this is awe-inspiring, whilst also being completely hypnotic. In a pure excited state of numbness, we find ourselves asking “How do they do it? 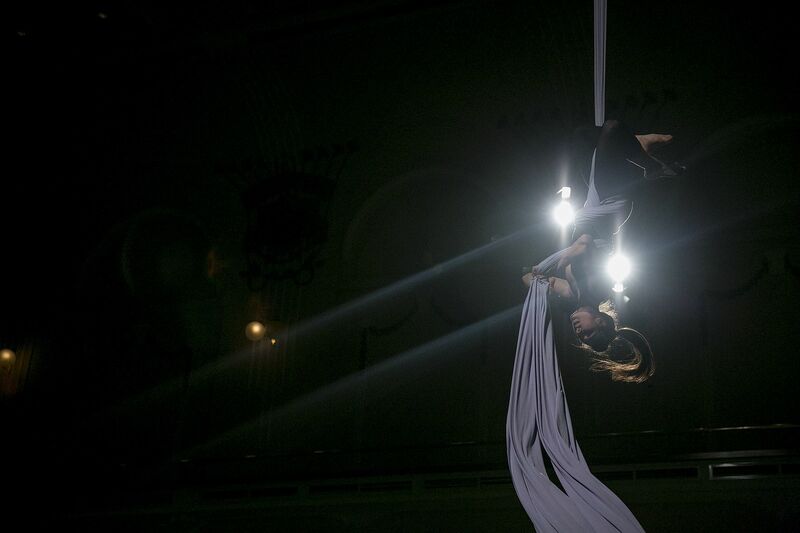 So high, such amazing acrobatics.” Undoubtedly these feelings are even more overwhelming for attendees of a congress where acrobats are doing somersaults above their heads and performing acrobatics hanging from silk ropes whilst smiling down at us. This is guaranteed to enhance the impression it leaves in their memories. This was also proved at this year’s Conventa trade show where two top acrobats performed at the opening ceremony. Picture the scene. You are standing at a reception or sitting at a conference where waiters and photographers are moving among the crowd. Suddenly, in the midst of everything, a man stands up and starts to sing Figaro in a thunderous baritone voice. At first you think he must be a madman or that he has come to the wrong place. However, when the waiting staff and photographers also join him, it becomes clear that this is an organised ‘opera invasion’, in the middle of an event. Of course, you are overwhelmed by surprise and excitement and you can’t believe that you have an opportunity to witness something so unusual and, at the same time, exceptional. This is how to spice-up an event which attendees will not only remember but will also sing along with!